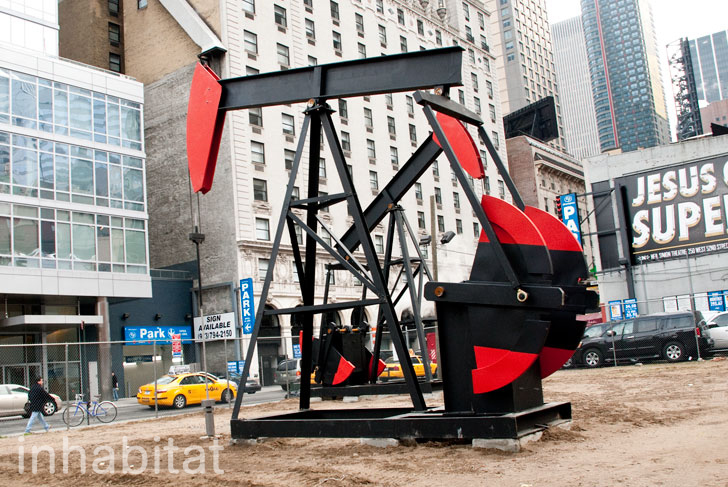 If you pass through Midtown in the next couple of months, you may notice something that seems a bit out of place: a pair of 25-foot tall oil pumps. The new industrial structures are part of artist Josephine Meckseper's installation called the "Manhattan Oil Project," which consists of two monumental, kinectic sculptures that strike conversation about American business, wealth, and consumerism. The project is supported by The Shubert Organization, The Last Lot and is presented by Art Production Fund. Meckseper’s initial inspiration came from a trip to Electra, a now desolate town that was once famous for being the oil capital of Texas. The huge mid 20th century oil pumps provide the base from which the scale models are designed. As an artist known for critiquing consumerism, Meckseper couldn’t have chosen a more perfect location for her first public installation. I really wanted to make works that reflected a sense of reality. Our society and our culture is really defined by the pathology of consumerism and wasting energy. There’s no clearer picture of the excess of our consumer culture than Times Square, and how it’s being used to distract people from real issues. With the amount of tourism and business that passes through the area, Meckseper couldn’t have chosen a more ideal location or time to draw attention to what is a growing concern throughout the US. Fracking is a hotly debated issue as the US turns to domestic sources for oil. In a weak economy, many in rural areas are tempted to lease their land for the immediate financial gains. However, for urbanites, the largest concern is often how such deals might affect the reservoirs they depend on for drinking water. Meckseper turns the tables by placing her scale models of oil pumps right in the center of Manhattan. The visual disruption, although perhaps beautifully executed, reminds us all of the issue at hand. What if oil rigs were set up right in the center of the city? How would it affect our lives and the environment? To answer for yourself, pass by 46th Street and 8th Avenue before the installation comes down on May 6, 2012. As an artist known for critiquing consumerism, Meckseper couldn't have chosen a more perfect location for her first public installation. "There's no clearer picture of the excess of our consumer culture than Times Square, and how it's being used to distract people from real issues," Meckseper told The Daily Beast. Fracking is a highly debated issues as the US turns to domestic sources for oil. In a weak economy, many in rural areas are tempted to lease their land for the immediate financial benefits offered by such deals. Meckseper turns the tables by placing her scale models of oil pumps right in the center of Manhattan. The 25-foot tall sculptures stand in an open lot surrounded by a parking lot with over five stories of cars piled high, a billboard sized ad for "Jesus Christ Superstar" and office buildings- all the consumption patterns in modern society that shed light on why we are so dependent on oil.